What if the first 50' deals 1d6 and every 10' after that adds another 1d6? I've spent many an hour going down (falling down?) this particular rabbit-hole myself. I think the fundamental problem in reconciling reality with D&D-like games is that health in D&D is in some respects binary -- you are either dead or effectively so (0 hp or less), or else you are "fine" (1 or more hp, which might be "near-death" in some sense but which doesn't impair your ability to act in any way. While LD50 may be 50' for a typical human, I feel confident in asserting without evidence that the vast majority of those that are NOT killed by a 50' fall are nevertheless incapacitated (broken/shattered legs, for example). There are also cases where people are killed by very short falls (a few feet), or survive falls at terminal velocity. 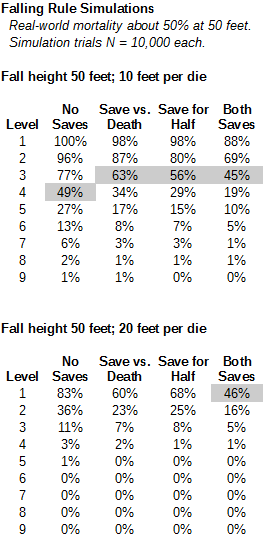 If you want high-level figures to still be as vulnerable to death from falls as commoners are (or nearly so) then I think the better approach would be to always just have a save vs. death for any fall, with the difficulty/DC of the save depending on distance. Save bonuses go up much more slowly than hit points, so "name-level" figures would still be intimidated by say a 50' or 100' drop. I agree that many non-fatal falls should result in incapacitation, and that's taken for granted in the post above. Many of those surviving will still be at unconscious 0 hit points (either by my save mechanic, or negative-hp rule, as one prefers) and so incapacitated. If anyone wasn't yet playing with one of those cushioning rules, I would highly recommend they make the switch (so as to account for exactly this either-fine-or-dead issue in book OD&D). I've never read the series, but from my understanding of it from other sources, Mervyn Peake's "Gormenghast" series featured several defenestrations and hurlings from castle spires. Mostly fatal, from what I've gathered. The only other literary example that springs to mind is Holmes & Moriarty at the Reichenbach Falls. Dunno if that's helpful 'cos only one of the participants of that scuffle actually met his end at the bottom of the falls, and I don't think Doyle was very explicit about it. Cool references! I did find two others by Conan: (1) dropped maybe 2 floors through a trap door, lands on his feet, runs off to further combat (Slithering Shadow, Ch. 3), (2) dropped through a trapped door into a rushing black river, swims off with sword in teeth basically fine (Jewels of Gwahlur, Ch. 1). From Slithering Shadow: "He did not fall any great distance, though it was far enough to have snapped the leg bones of a man not built of steel springs and whalebone. He hit catlike on his feet and one hand, instinctively retaining his grasp on his saber hilt..."
Conan is essentially a panther in sandals and a chain mail hauberk. Of course he lands "catlike on his feet" and is made of "steel springs and whalebone". He's fantasy Chuck Norris. Hmm, can't think of any examples in pulp fiction to go by. I recall a similar discussion around Mutants and Masterminds about how deadly a fall should be in a system that lets you shrug off a blast of lava to the face. This is one of those issues that also falls back on to "What is a Hit Point?" and "Are high level characters still normal/mortal?" I would almost be inclined to say that Falling, like swimming in lava, is one of those things that should not interact with HP. Otherwise I am inclined to say, in the absence of a greatly improved rule, stick with the original. I used to think that myself (that environmental stuff should not be linear with HP), but I've come around in the other direction over the years. On the hand, the pulp literature seems to give characters extra-survivability in those cases (see my Conan fall above); on the other real-world hand, we have the many examples of spectacular survivorship by certain lucky or iron-willed people (far more than twice the average in falls, lack of air, survival with no food, e.g.). So I've grown more comfortable with high-level PCs being extra-tough in all kinds of pursuits. I confess the sin of not reading the linked references before commenting, but: do the sources on falling-damage LD50 also consider the surface landed upon? Perhaps many of the survivors landed in water, while many of those who died landed on concrete? I haven't seen it broken down that way. Since the majority of falls are construction accidents (off a ladder or roof of a home), I think that cases of falling into water is probably negligible. Also, cases tend to only get documented where there is some injury. Landing in water from great height is better than landing on concrete, but not all that much better. Water resists impact surprisingly well. Absolutely true. On the other hand, the pulp sensibility/examples are that it's a lot safer, so if one made it safer in their game, that's a defensible design choice. "This is longer and more annoying than the standard falling damage chart, and harder to use. But it is a more consequential, and less predictable system which makes falling both more dangerous for high level characters and also possibly-survivable for low level ones." This is quite relevant to me, as I'm currently running Patrick Stuart's Deep Carbon Observatory, and the group are just about to head down into the Veins. In the last session, they dropped the white Giant off the bridge into the darkness below, and it's important to know if it survived. On the one hand, it's a huge creature, liable to take more damage, on the other, it is entirely cartilaginous, and fell into water. And it had a lot of HP and a very good ST.
From 10-60' it seems like the same average results with greater complication. (To me, the Nd6 is variable enough.) The 70-90' extra damage is like Gygax's cumulative rule: exponentially more aggressive than reality. As in the post above, if 10' is 1d6, then the 50d6 average shouldn't be reached until 500'. Of course, if one thinks that HP simply shouldn't provide linear resistance to environmental factors like falling (e.g., Baquies above), then that's a different story -- but not what Stuart seems to be arguing. Oh bypassing HP wasn't my personal viewpoint, just exploring a line of thought. It is probably valid for some settings, game types. I am comfortable with high level folk surviving/doing crazy stuff. What would be the effect of the character's encumbrance upon the kinetic energy of the impact? Would it increase lethality? What if the falling damage were something like "1d6 + level per 20 ft."? This might balance the "HP are just for combat" and "extra survivability" arguments. My hastily made spread-sheet shows that the average-HP and average-falling-damage intersect at 5th level (with the above formula)(for a d6 HD). Not knowing the math behind the saving-throw calculations, I have to leave the rest as an exercise for Dan. Well, since kinetic energy is proportional to mass (KE = 1/2 mv^2), having more encumbrance does increase KE proportionally. Although then one debates how much that extra stuff soaks up the KE at the end of the fall (e.g., sack of rations and potions squashing and partly breaking your fall). Maybe an overall wash in terms of damage to the person? Encumberance was my thought as well, that perhaps Gary Gygax had in mind the weight of the armour that typical adventurer is wearing when falling and so thirty feet may have 'felt' about right. Certainly a knight in plate would have a different LD than a man in a tracksuit. interstingly, right after putting some numbers down for falling rules, I get my computer and ... here is this post! my conclusion, based of simplistic calculation is that the rule of 1d6 per 01 feet is the average of linear and squared damage for speed (so I decided to postpone any more calculations). -I simplified the situation by deciding that the acceleration would be "instant" and "after the fall: for example, after 1 seconde, you're going exactly 30 feet/second. I used this as base damage (3d6). anyways, as I mentionned: extremely simplistic, as there is no wind resistance. I decided for 3d6 as the base because it's the amount of damage that would seriously hurt a first level character (I give some bonus HP at first, from Tao of D&D's rules). Without being able to decide, I averaged the results, and we're back to 1d6 per 10 feet. Maybe they were unto something: this rule is very gameable, players can quickly judge their survival odds and the results are good enough. Cool! I agree with that latter point: game-able and tractable for players to estimate and make a decision about in-game. It is funny that more complicated analyses bring us back to a simple 1d6/10' in many cases. I can also see the attraction of some more hit points at 1st level; there are times I wish that the 1st-level increment was 3d6, so that progression to 2nd level wouldn't be so radical. But then we'd have to possibly re-gauge all the combat damage, because a legitimate criticism would then be "a sword thrust should have at least a chance of killing a normal man". I wonder if a good way to handle this might be to shift the focus onto the ST and away from HP. We know the LD50 is 50 ft, so set the average Death save (or whichever save you feel is most appropriate) for level 1 characters to give a 50% chance. Say, for the sake of argument, that a level 1 character saves on a 15+ (so a 6 with Target20, or 15 with straight OD&D). Then a 50 ft fall needs a +4 to the save. 1) Fail (0-9): lose 2x max HP (probably resulting in strawberry jam on the ground). 2) Fail (10-19): lose 1x max HP (maybe killing you outright, but perhaps surviving with negative HP, albeit unconscious and dying). 4) Pass (30+): no damage. 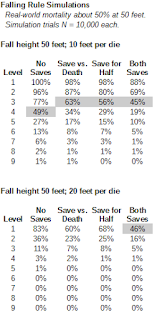 However, the save needs to be modified to account for height fallen. Maybe -1 per 10 ft, so a high level character can fall about 50 ft further than a low level character. This could also be nonlinear up to however far it takes to reach roughly terminal velocity. Finally, modify the save depending on size. Small creatures take less damage than big creatures, so +0 for human sized characters, then +2 for each halving of size, or -2 for each doubling of size (or possibly a +2, +5, +10, +15 progression). As a quick test, a level 1 mouse falls 100 ft, that's 16 = 6 - 5 (height) + 15 (size). Ends up at zero HP 20% of the time, half HP 50% of the time, and full HP 30% of the time. A level 1 elephant falls 10 ft, that's 0 = 6 + 4 (height) - 10 (size). The elephant splats 50% of the time, and is knocked unconscious the other 50%. A bit of tweaking probably necessary, but it seems reasonable given a cursory look, and no worse than basing things on HP. Ugh, I forgot to add in the +4 I mentioned at the start! In the falling damage discussion I always have wondered, why should damage scale linearly with height? Yes, work, and kinetic energy, I see that, but why is damage linear with energy? I would have guessed that damage is linear with the (resultant) force. It is force that breaks bones and splits skulls, right!? Force (F) determines how fast (time t) momentum (p) can be changed: F = dp/dt. Momentum is mass times velocity (p = mv). So, from this I would have guessed that damage scales linearly with force which scales linearly with momentum (and thus velocity for a given mass)!? But, then it finally dawned upon me: You also have to take into account how much there is available for the force to act on the body. Hmm ... how much is available? Well, the time between hitting the ground first with a body part until the full stop where the body lies (scattered?) on the floor. During this time the center of mass covers a certain height and this height is independent of speed, but the amount of time to cover this height does scale with t~1/speed. F = dp/dt which scales as v / (1/v) = v^2. So, the force scales with v^2 and thus linearly with KE (and thus height), after all!? And, yes, now I also understand how the work argument comes into effect: work equals force times distance (W = Fx). To drop the velocity to zero, you need a force whose work nullifies the total KE. Since x is constant, as explained above, the force must scale with KE (and thus height). In short, I think the fundamental quantity is force and not KE per se. However, the force does scale with KE, so there is that. I guess I am not smart enough to see the connection right away, but with the above reasoning, I agree with your statement! KE to overcome = Work = Force * distance. The distance is the the height you cover between firstly touching the ground and the final stop. This distance is independent of the falling height, and thus force must scale with KE. Forgive me if you had already alluded to this in your post and I just missed it, but would it not be sensible to multiply the damage by the hit dice of the creature? Then you could have a flat die progression and calibrate it to what the hp of a normal man is in your system. In mine, a healthy adult has 4 or 5 hit points. Taking into account the save vs death, I'd assign 50' a damage of 1d10, as 5.5*0.65+2.75*0.35=4.5375. The short story for me is that in the past I used to work such systems. More recently I want to honor the higher hit dice as really super-humanly more durable to falling, exposure, cold, etc., and so more simply not adjust damage in that way.